Over the last 5 years or so, Michigan based band The High Strung have been one of my favorites. This trio (originally a quartet) consistently writes and records catchily energetic rock songs with clever lyrics and enough hooks to outfit a an old-fashioned fishing vessel. Likewise, their live sets tend towards the frenetic with drummer Derek Berk briskly beating his kit into near oblivion over the funky, dancing bass riffs of Chad Stocker. Over it all, vocalist/guitarist Josh Malerman adds fuzzy riffs and emotive, high-pitched lyrics that manage to be both intelligent and memorable. It's always been great stuff, as evidenced by their previous albums, These are Good Times and Moxie Bravo. Then, after the 2005 release of Moxie Bravo, it seemed like The High Strung kind of disappeared. At the time, I heard that they had started playing public libraries and other non-traditional venues as they worked through new material and old (and they got a nice piece on National Public Radio to boot). Finally, in mid 2007, the band released their newest record, Get the Guests, on Indie Park the Van records (home of acts like Dr. Dog and The Teeth). Upon getting a copy of it, I wondered how the years and change in musical venues had effected their music. Upon my first few listens, I could easily imagine that many reviews of this new record would cite the band's new found "maturity". While this may be true in a very technical sense, I suspect most listeners and readers see the word "mature" and think "slow and boring". In the case of Get the Guests, neither is applicable. Rather, The High Strung's latest record has both the catchiness and the energy of their previous efforts. Instead, what this album has is more nuance in both the recording and in the songs as a whole. With 17 tracks in a little over 50 minutes, it's probably a bit much to look at every track on the record. So let's just take a look at the highlights. 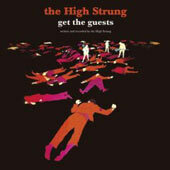 Get the Guests begins with What a Meddler, an up-tempo jangling number that features the trademark memorable hooks of The High Strung while adding a nice horn section which counteracts Malerman's vocals. From there, the band moves on to Maybe You're Coming Down With It, which is, oddly enough, perhaps my favorite song on the record. This one begins with a rather funky, dancing melodic bassline courtesy of Stocker, with the drums clanging behind it. While the verses are typical of the band and rather fun, it's on the chorus that the songs becomes something else entirely. The entire band harmonizes in an almost choral way, while the music fills out as it runs through an unexpected, almost minor chord progression. It's a very beautiful moment that transcends the conventions of the 3 minute Indie tune. With the juxtaposition between verse and chorus, and the additional of a pretty organ bridge, the song just seems epic. Later on, the band introduces The Baddest Ship which features a compelling piano riff over a fuzzy guitar and yet another strangely hypnotic melodic progression before moving on to Raise the Bar, which may be the song most reminiscent of earlier work by The High Strung. Then at one point, The High Strung combines their trademark rock style with their notable lyric playfulness on Rimbaud/Rambo, as they combine frenetic music with an observation on the similarities of the titular two individuals. Yet, I've always been partial to Malerman's gentler, more narrative songs, and two tunes in the middle of the record fulfill this need. Watch Me Sustain the Early Days begins with a fast, snare-heavy beat from Berk over which Malerman sings in a lower range than usual. This quick arrangement gives what could be a soft ballad added urgency and intensity, all of which highlights the resolve present in the lyrics. From there, the band moves on to the somewhat cheeky blow-off She's Not Even Mad at You. With acoustic guitars over a bass line that holds the melody, the emphasis on this one is the lyrics, as Malerman essentially explains to someone that they are really not that important. Of the later tracks on Get the Guests, the highlight is There was No One Before You, There was No One Before Me. This song has layers of effects and piano which fill out the band's middle range, giving a wall a sound of effect that almost recalls Athens band The Possibilities. It's beautiful and echoy, emphasizing the musical tension between the soaring, insistent music and Malerman's slowly plaintive plea. More than almost any other song on the album, it shows how The High Strung have fine-tuned their sound and added elements which underscore the fundamental strength of the musical offerings. In the end, it seems like the changes The High Strung have gone through over the past couple of years have served the band well. Get the Guests is the most fully realized of all of their records, with songs that range from quiet and almost meditative to epic rock outs. Furthermore, the album also offers glimpses at how this talented band might progress musically in the future. Yet, underneath it all, The High Strung are still the same band with an uncanny talent for catchy riffs and clever lyrics which attracted their earlier fans.